The OptRx crop sensor system measures and records crop health in real-time using the reflectance of light shined on the crop. Sensors can be mounted on virtually any type of vehicle to collect information while driving through the field. Information collected, including vegetative index, can be used to measure the impact of nutrients, water, disease and other growing conditions on crops. Additionally, through the DirectCommand application system, you can sidedress nitrogen to the crop based on the recommendations made by the OptRx system. Do it right, and do it once. 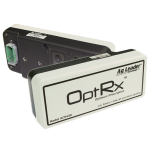 The OptRx crop sensor system is compatible with the Ag Leader Insight and Integra displays. The OptRx crop sensor system is compatible with John Deere sprayers utilizing the 2600 or 2630 displays via serial-rate data transfer. The OptRx crop sensor system can be calibrated using a “virtual” reference strip (preferred), or N application rates can be user-assigned. The OptRx crop sensor system calculates NDVI (useful after V4 to assess N needs for developing biomass) and NDRE (useful after juvenile stages to assess N needs for maintaining steady maturity). Utilizing the OptRx system and the 360 YDrop system from 360 Yield Center, convert your sprayer into a nitrogen-application juggernaut! We use OptRx to try to get our nitrogen down in a timely fashion. We are no-till farmers and do a split application of anhydrous in the fall and urea in June around V8 on the corn. When we variable-rate spread based on the readings from the OptRx, we are able to put the nitrogen where it needs to be.